VAN DER AA -Prospectus Pontis Sixti in Locorvmq adjecentivm . . .
VAN DER AA, P. - Prospectus Pontis Sixti in Locorvmq adjecentivm . . . Prospectus Pontis Sixti in Locorvmq adjecentivm . . . - VAN DER AA, P.
Title : Prospectus Pontis Sixti in Locorvmq adjecentivm . . .. Size : 13.8 x 13.2 inches. / 35.0 x 33.5 cm. Description :Three plates on one sheet. 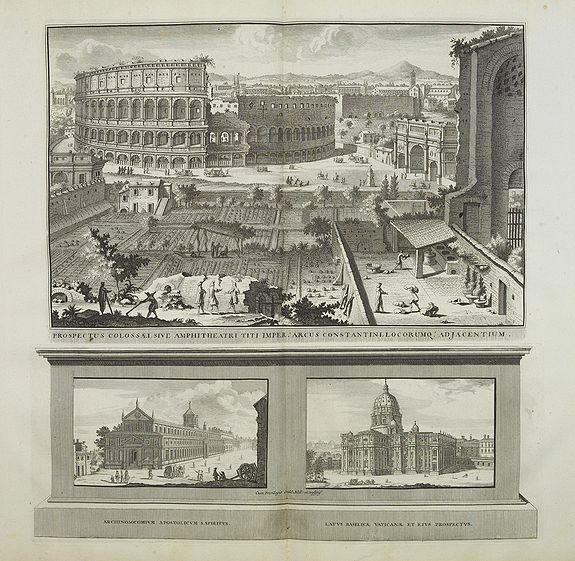 Upper one showing Coliseum in Rome, in lower part St. Peter's Basilica in the Vatican. Pieter van der Aa was a prolific publisher. He published a.o. "Naaukeurige versameling der gedenkwaardigste zee- en land-reysen", a series of accounts of voyages (1706-08) and "Galérie agréable du monde", completed in 1729. Condition : In good condition, dark impression. With wide margins.